"Mom! I know what 1million + 182 + 50 - 100 + 1 = ... 1,000,133." Wait a minute ... What?! Tell me your math problem again, T.
"I saaaid, '1million + 182 +50 -100 +1 =1,000,133.'" Tonite, I found a quiet moment, showed him the paper and prompted him to share what was going on. "I didn't do this, Mom." Keep in mind, T's a super kid. He tows the line and then some. But it's a full moon out and the boy can act just as squirrely as the next kid. And lately he has, believe me! So I looked him straight in the eye and started my lecture about honesty amidst my concerned discussion about math and writing numbers correctly and what could have caused these reversals ... "Honest, Mom. It wasn't me." By now, I'm starting to get mad. The reasonable, compassionate, concerned-over-stress-induced-new-found-dyslexia-in-my-sweet-baby-boy mommy had flown the coop. I stood in her place. Ever so quietly, and so as not to be noticed, Meiners had sneaked up beside us and stood nonchalantly listening to our conversation. I glanced in his direction. Understanding sinking in. I turned to Meiners. "Meinie, did you finish this paper?" Laughing, I repeated, "Meiners, did you finish this math paper?" He has always believed he was born a triplet. This sweet little boy who is only 5 and sits at the dinner table soaking in all the math and spelling questions that Daddy uses to quiz the big kids. He's been listening. 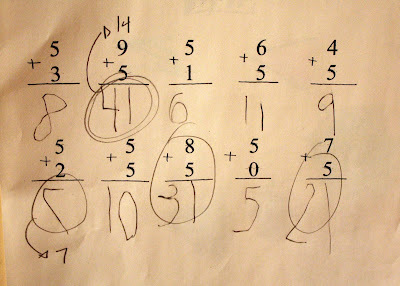 And the boy can do math. Maybe a little backwards. But darn good for a 5 year-old kindergartener!